'This is Miyazaki unreservedly playing things safe; a simple film by design that delivers simple pleasures'. Surprisingly perhaps for a director of animated cinema, the vast majority of Hayao Miyazaki's work is clearly aimed primarily at a more adult audience. Even Spirited Away, featuring a ten-year-old girl as its heroine, is a story told from a largely grown-up perspective and predominantly tackling more mature themes and ideas. Which makes Ponyo something of an oddity within the Miyazaki Collection, being as it is a film almost entirely crafted for a very young audience. Of course, that isn't a problem in itself, but it does make the film stand out from much of Miyazaki's other work, and not always for the better. Taken purely as a film for children, Ponyo has to be seen as a success. In fact, if you're considering its suitability for an audience of little ones you can almost certainly add another star onto the score at the end of this review. The world of Ponyo is endlessly sweet and charming; a place where a town being hit by a tsunami and flooded is met by the townsfolk cheerfully forming a convoy of boats to work through it together. Any under-tens watching will lap this up, undoubtedly becoming enamoured with both Ponyo (Yuria Nara) and Sōsuke (Hiroki Doi) as much as the pair fall head over heels for each other. The issues within Ponyo seem largely to be those that were manifested within Kiki's Delivery Service almost twenty years earlier. At the time of writing I admittedly have yet to see the earlier work, but based on Sam's review there are a number of limitations common to both films. There is essentially very little wrong with Ponyo, but there is also very little outstanding about it either. In terms of story and characters, this is Miyazaki unreservedly playing things safe; a simple film by design that delivers simple pleasures. Whilst that makes Ponyo a film almost impossible to dislike, it's also likely to have the adult members of the audience coming away notably less satisfied than with most other Miyazaki films. 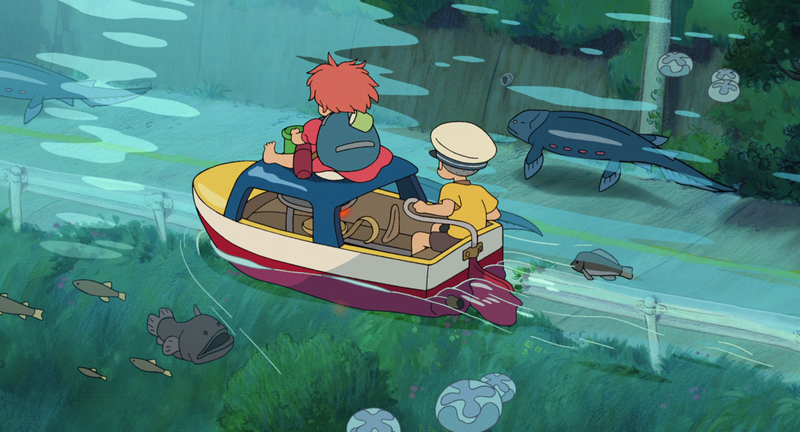 There are occasional moments of excellence contained within Ponyo, however. The opening sequence of sorceror Fujimoto (George Tokoro) casting spells deep beneath the sea is in isolation a pure Miyazaki masterpiece - it's a shame that more of the rest of the film is not set below the waves, as the director is clearly in his element playing with the cornucopia of ocean creatures at his disposal. The tsunami sequence is also artistically and cinematically well-executed, aesthetically reminiscent of traditional Japanese artwork. Ponyo ultimately feels like Miyazaki allowing himself to make a film whilst not firing on all cylinders. But, even when he's not stretching himself to his full potential, the director still manages to turn out perfectly entertaining family-friendly fare such as this. Relative to Miyazaki's best work, Ponyo may be somewhat underwhelming, but it's still a consistently enjoyable and well-made film in its own right. The Hayao Miyazaki Collection brings together all 11 of the director's feature films, from The Castle of Cagliostro to The Wind Rises, on Blu-ray for the first time. It is released in the UK on Monday 8th December 2014.